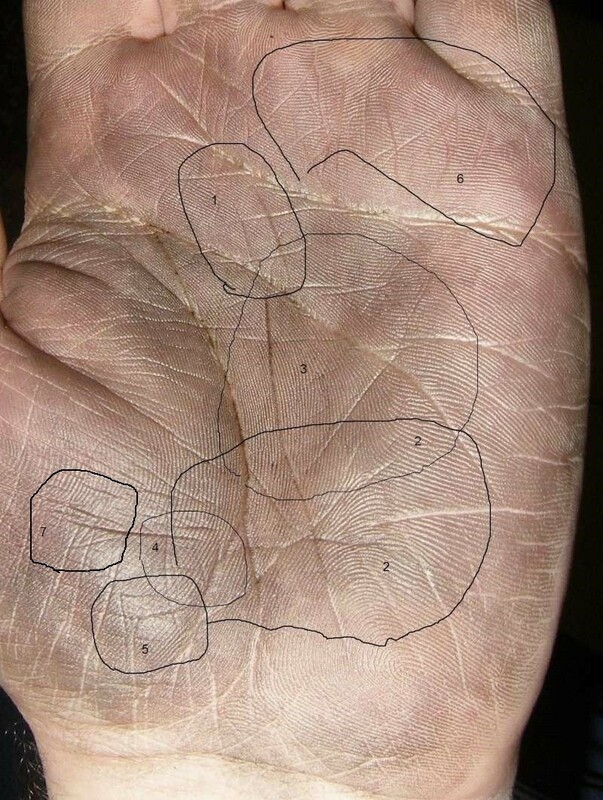 What do the signs on the photo of my left mean in the regions marked by black (I'm left-handed person) - on the mount of Venus, mount of Mercury, mount of Apollo, as well as on the Fate line & Life line. 1. two squares one above the other and a triangle above the latter - what a figure is it? 2. there are some Life line branches to Fate line, which are finishing by a fork or a trident and form something similar to a star. 4. there is a triangle or a fish on the Life line in the region of the mount of Venus. 5. there is something similar to a flag on the mount of Venus. 6. there are some indistinct signs on the mount of Mercury and the mount of Apollo. 7. there is something similar to a trident on the mount of Venus. What do these signs and lines mean? What are my perspectives in commerce? fish sign in the quadrangle interest in occult science.. the direction shows you will be always at good position .. you will be boss... rajah loop at jupiter confirms your nature too..
fish sign on life base... again good sign..
head line droping to moon.. imiginations are strong... and the pattern formation on the luna is also good and serves as canals of thoughts.. you might be interested in poetry and should write your own too..
First of all Thank you very much for your comments. Your interpretations are very similar to realty. Does it mean a short life in about 4-5 years after 35 or change in life?